Pakistan Tehreek-e-Insaf (PTI) (Urdu: پاکستان تحريک انصاف‎, "Pakistan Movement for Justice") is a centrist political party in Pakistan founded in 1996 by former international cricket captain and current Prime Minister of Pakistan Imran Khan. As a result of the 2018 general election, PTI is the governing party of Pakistan as the largest party in the National Assembly in the ruling coalition. The party aims to create a welfare state, where the state is responsible for education, health and employability of citizens. It promotes freedom of thought and dismantling religious discrimination in Pakistan. Directly following its founding in 1996, the party had little initial success. Khan won a seat in the Pakistani general election, 2002. The party boycotted the 2008 election, but in 2013 it received over 7.5 million votes, making it second in the number of votes and third in the number of seats won. In 2018, it received 16.9 million votes, the largest for any political party in Pakistani history. Following this successful election into office, the party nominated its leader Imran Khan to be Prime Minister. Currently the party is in government at the national level and governs the provinces of Khyber Pakhtunkhwa and Punjab. It is also a part of the coalition government in Balochistan and acts as the largest opposition party in Sindh. The party terms itself an anti-status quo movement advocating egalitarian Islamic democracy. It claims to be the only non-family party of mainstream Pakistani politics. With over 10 million members in Pakistan and abroad, it claims to be Pakistan's largest party by membership. Pakistan Tehreek-e-Insaf was founded by Imran Khan on 25 April 1996 in Lahore, Pakistan. Founded initially as a sociopolitical movement, in June 1996 the first Central Executive Committee of Pakistan Tehreek-e-Insaf was formed under the leadership of Imran Khan, including Naeemul Haque, Ahsan Rasheed, Hafeez Khan, Mowahid Hussain, Mahmood Awan and Nausherwan Burki as founding members. PTI began to grow slowly but did not achieve immediate popularity. Khan launched PTI as a party which he claimed represented the true aspirations of the people of Pakistan. Pakistan Tehreek-e-Insaf's constitution was approved on 24 January 1999 by the Central Executive Committee in Lahore. In October 2002, Khan ran for office in the National Elections and became a member of parliament (MP) for Mianwali, his home town. Khan, however, remained deeply critical of the entire political order of Pakistan, which he deemed corrupt, inefficient, and morally bereft of any of the founding principles of Pakistan. In protest, Khan began a grassroots campaign to raise awareness about his political party. After Benazir Bhutto was assassinated in 2007 and Nawaz Sharif returned from self-exile in Saudi Arabia, pressure increased upon President Musharraf to hold democratic elections. PTI, in conjunction with many political parties, joined the All Parties Democratic Movement, which was opposed to further military rule. The general election in 2008 resulted in a PPP victory. This election was boycotted by PTI. During the presidency of Asif Ali Zardari, Imran Khan's popularity soared amid discontent with the ruling administration's domestic and foreign policy. PTI promised to create an independent, self-reliant Pakistan free from debt, dependency and discord. In Pakistan: A Personal History, PTI chairman Khan argues that a selfish and corrupt ruling elite, primarily made up of politicians, feudal leaders, and military bureaucrats, had destroyed Pakistan and brought it to the brink of disaster. PTI maintains that it represents all Pakistanis, regardless of religious, ethnic, linguistic, and provincial backgrounds. Pakistan Tahreek e Insaf's agenda envisions a modern Islamic republic that advocates individuals' welfare through community co-operation. PTI wants to set Pakistan on a course to political stability, social harmony, and economic prosperity for all religious, ethnic and racial communities. PTI has an agenda to blend traditional social and religious values and cultural and ethnic diversity of Pakistan into common goals and aspirations for a just society based on Mohammad Iqbal's and Mohammad Ali Jinnah's vision of Islamic democratic culture providing social security, welfare and the rule of law. Mohammad Iqbal's work has influenced Imran Khan in his deliberations on an "Islamic social state". The party manifesto includes a desire to provide credible leadership, to restore Pakistan's political and economic sovereignty, to establish a strong system of accountability and to combat corruption. The party has a published constitution. It aims for unity, solidarity, social justice and prosperity. The Central Executive Committee is its main central council, with a duty is to assist the chairman with the day-to-day functions of the National Council, to lay down party policy, to guide the party at national level and to act as executive authority of the party. The chairman is the head and the chief spokesman of the party. His duty is to ensure that the organisation works at all levels in accordance with the aims and objectives of the party. He may delegate his powers to the Secretary General or any member of the Central Executive Committee. He may suspend any office bearer pending disciplinary action. In the event of removal or suspension of an office bearer, he may delegate power and duties of such office bearer to any other member of the Party. A new constitution was drafted by a committee headed by lawyer and Senior Vice-President Hamid Khan, creating the positions of Vice-Chairman and President. The PTI has called for major social, economic, and political reforms. The PTI's ideology is derived from Allama Iqbal's vision of a self-reliant, modern democracy following Islamic principles. In 2011 the PTI promised to stop all foreign aid if it comes to power. The PTI maintains that corruption in all of its forms – whether moral, financial, spiritual – has ruined Pakistan, and therefore a culture of accountability and transparency is needed to restore faith in the system of government. The PTI has argued for religious tolerance and greater representation for minorities. Christians, Sikhs, and Hindus have joined the PTI. The PTI has also spoken out for senior citizens, poor people, and women. PTI believes in raising education standards across the country, universal literacy, and promoting schools and colleges. On 20 February 2013 PTI launched its 'Education Policy' with plans to introduce a uniform education system with one curriculum for all and education in mother tongue and in Urdu at primary school. English would be taught as a subject. PTI believes that educational institutions should be de-politicized and their governance devolved to town level. The party believes in measures to promote adult literacy for those aged 15 to 30 and to educate women. The PTI has called for a complete overhaul of Pakistan's current political order The PTI believes in abolishing feudalism, economic inequality and government mismanagement. The PTI promised to crack down on police brutality, restructure the civil service, reform the electoral system, allow for a truly independent judiciary, decentralise state power, and enforce laws which extend personal liberty. On 18 August 2014, Khan announced PTI would renounce all its seats won in the 2013 elections, claiming the elections were rigged. He accused Prime Minister Nawaz Sharif of plundering the national wealth and demanded his resignation. He called on the public to withhold taxes and payment of utility bills to force the government to resign. On 22 August 2014 all 34 PTI lawmakers resigned from the national assembly. The PTI propose civilian control of Pakistan's military. The Inter-Services Intelligence service would report directly to the Prime Minister of Pakistan, and the defence budget would be audited by the government. Imran Khan also pledged to resign should any terrorism take place from Pakistani soil following these reforms. Pakistan Tehrik-e-Insaaf organised a protest against drone attacks in Pakistan on 23 November 2013 at Peshawar, where it called on the federal government to force an end to U.S. CIA drone attacks and to block NATO supplies through the country to Afghanistan. "We will put pressure on America, and our protest will continue if drone attacks are not stopped." The U.S. embassy declined to comment on the protest that also temporarily closed a route leading to one of two border crossings used for the shipments. Chairman PTI Imran Khan with Secretary of State John Kerry. The PTI believes in pursuing a foreign policy based on a nationalist agenda, which it believes will safeguard all of Pakistan's national interests and promote greater regional co-operation. The PTI would forge stronger relationships with neighbouring countries, but not at the cost of Pakistan's national sovereignty or territorial integrity. The PTI would fully restore Pakistan's economic and political sovereignty if elected into power, and has consistently vilified the PPP-led federal government for subverting Pakistan's national interests and strategic ambitions to please international powers. The PTI hopes to have a relationship with the US that would be based on "self dignity and respect". The PTI will also stop all foreign aid to Pakistan. The PTI would make the Kashmir issue a top priority and would try and solve the issue permanently so that Pakistan no longer has any border or territorial disputes with any of its neighbours. Pakistan Tehreek-e-Insaf contested the general elections of 1997, 2002, 2013 and 2018. It boycotted the 2008 general elections. Less than a year after its founding, PTI contested the 1997 general elections. Imran Khan stood in seven constituencies across Pakistan but did not win a majority in any. In the 2002 general elections, party chairman Imran Khan won one seat from Mianwali. PTI secured 0.8% of the popular vote. 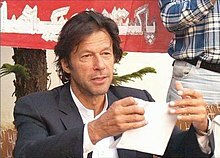 Imran Khan tearing his nomination paper at a press conference in 2007. PTI boycotted the 2008 general election. PTI openly boycotted the Pakistani general election on 18 February 2008 because it believed that the election was fraudulent and laced with irregularities. On 21 April 2013 Khan, the chairman of PTI, launched his campaign for the 2013 elections from Lahore where he addressed supporters at The Mall, Lahore followed by prayers at the Data Durbar Complex. which was followed by large rallies in Karak and Dera Ismail Khan. He also announced that he would pull Pakistan out of the US-led war on terror and bring peace in the Pashtun tribal belt. On 22 April 2013 Khan addressed different public meetings in Malakand, Lower Dir District and Upper Dir District where he announced that PTI will introduce a uniform education system in which the children of rich and poor will have equal opportunities. On the same day he spoke at a rally in Rawalpindi's Constituency NA-56 accompanied by Shaikh Rasheed Ahmad. On 23 April 2013 Khan addressed large rallies in Renala Khurd, Okara and other parts of Sahiwal Division. He challenged PML-N President Nawaz Sharif to a live debate, a challenge which PML-N was quick to decline. On 24 April, Khan addressed rallies Nankana Sahib District, Sheikhupura and Pattoki where he announced that once he comes to power no parliamentarian will receive development funds as they are misused for achieving political gains. On 25 April 2013 Khan addressed political gatherings in South Punjab including in Pakpattan, Lodhran and Vehari. On the following day Khan continued his mass campaign in South Punjab, he addressed rallies at Jalalpur Pirwala, Muzaffargarh, Mian Channu, Kabirwala and Khanewal where he promised to end the system of tyranny and announced that once in power he will make law which will allow every village or town to elect its own Station House Officer which he believes will prevent corruption and police brutality, he also promised to eliminate the post of Patwari and make a computerised and professional land record system. Khan ended his south Punjab campaign by addressing rallies at Bahawalpur, Khanpur, Sadiqabad, Rahim Yar Khan and Rajanpur on 27 April. During the campaign he collectively visited over 25 towns and cities and addressed dozens of rallies and corner meetings, at the end he promised to hang the killers behind the assassination of Benazir Bhutto he also said that the local government system is important for prosperity of Pakistan. On 28 April, Khan moved to central Punjab where he addressed large rallies at Mandi Bahauddin, Hafizabad and Sargodha while promising people to bring justice and equality to Pakistan. On 29 April 2013 Khan addressed rallies at Murree, Talagang, Chakwal, Taxila and Attock. On 30 April, Khan visited his home town of Mianwali where he addressed several rallies, he lashed out on Bhutto's and Sharif's. He is quoted to say 'You can't lead revolution from behind bulletproof glass' he also claimed that he had conquered fear of dying 17 years ago. On 1 and 2 March, Khan addressed gatherings in Sibi, Loralai, Zafarwal, Pasrur, Narowal, Jacobabad and also led a car rally in Rawalpindi. On 3 May Khan continued his campaign at Battagram, Mansehra, Torghar District, Abbottabad and Haripur, followed by rallies at Buner District, Swabi, Charsadda, Mardan, Nowshera and Peshawar on 4th while promising to abandon war on terror. On 23 March 2013 (Pakistan Day) Imran Khan addressed over 100,000 supporters at Iqbal Park and made six promises to the people of Pakistan if he comes to power also known as Imran Khan's six pledges. I will always speak the truth to the people of Pakistan. The PTI government that will come into power, I promise that we will try to end tyranny. I will never take my money out of Pakistan. I will never take personal benefit from being in government, nor will my relatives be allowed to benefit from my being in power. I will protect your tax money. We will stand together with every Pakistani in or outside Pakistan. On 7 May, four days before the elections, Imran Khan was admitted to Shaukat Khanum hospital in Lahore after sustaining head and back injuries falling from a forklift that was lifting him onto a stage at a rally. The incident received extensive media coverage in Pakistan. Chief Election Commissioner Fakhruddin G. Ebrahim, PML-N chief Nawaz Sharif, Muhammad Tahir-ul-Qadri, and the Muttahida Qaumi Movement all expressed their sympathy over Imran's injury and prayed for his swift recovery. Najam Sethi, Shahid Afridi and all central party leaders visited Khan at the hospital. The former chief minister of Punjab Shahbaz Sharif, then Imran Khan's political rival, visited Imran at the hospital. Political leader Nawaz Sharif, whom Imran Khan was campaigning against for position of Prime Minister in the upcoming elections also announced that he is cancelling his election campaign as a show of solidarity. Nawaz Sharif expressed deep concerns over Imran Khan's injuries. During an election rally he was holding in Rawalpindi, Nawaz Sharif prayed with all participants at the rally for his health. He then announced that there will be no more rallies and urged his supporters to go home and pray for Imran's recovery. Pakistan's 2013 elections were held on 11 May 2013 throughout the country. The elections resulted in a clear majority of the Pakistan Muslim League (N), a strong rival of Pakistan Tehreek-e-Insaf but it did managed to take over the Pakistan Peoples Party as the main opposition to PML-N's candidates in the Punjab Province where the parties popularity was able to push 20 representatives to the Punjab Assembly. PTI also emerged as the second largest party in Karachi. While according to non-official results announced by Pakistani media and the Election Commission of Pakistan. Imran Khan, Chairman of PTI won three of the four constituencies he contested winning from Constituency NA-1, Constituency NA-56 and Constituency NA-71. While Khan's party PTI won 31 directly elected parliamentary seats which is more than 300 percent more than it got in 2002 elections. PTI was third largest party nationally as well as being the largest in Khyber Pakhtunkhwa and second largest in Punjab. In Khyber Pakhtunkhwa, PTI defeated all mainstream political parties across the province with mostly new candidates. It also won every seat in Peshawar, Nowshera and Mardan district, it is expected that PTI will lead a coalition government in the province. PTI couldn't manage to win a majority in Punjab but made some wins while barely managed to make any inroads in Sindh or Baluchistan. PTI got 34 out of 99 seats in the Khyber Pakhtunkhwa Assembly. According to the polling data available, PTI performed considerably well in Central and Southern Khyber Pakhtunkhwa, while it ceded ground to Jamaat-e-Islami and Jamiat Ulema (F) in Northern Pakhtunkhwa. In Khyber Pakhtunkhwa proper, the party failed to get more than 5% of the polled vote in only one constituency, NA-22 Battagram. The party also didn't fare well in FATA which borders the Pakhtunkhwa province. Here PTI won only one constituency, NA-47, out of 12 while failing to win more than 5% of the vote in 3 constituencies NA-36, NA-37, NA-41. In Punjab, the party performed the best in the North and the South, where its largest share of seats came from. It managed to win more than 5% of the vote in all constituencies of Northern Punjab. While in Southern Punjab its support was mainly concentrated in Multan along with a belt of districts surrounding it, which include Khanewal, Vehari and Pakpattan. Its performance was lackluster in Rajanpur, Dera Ghazi Khan, Bahawalnagar, and Muzaffargarh. PTI's performance in Central Punjab was limited to gains in the districts of Mianwali, Lahore, Sahiwal, Nankana Sahib, Sheikhupura and Faisalabad. Mianwali district, from where the party's leader, Imran Khan belongs, saw the highest votes polled in the favor of PTI in Punjab at an average of 59.85% in the district's two constituencies. Among other major districts, it performed the worst in Jhang and Sargodha. In Sargodha it failed to win more than 5% of the vote in 3 out of 5 constituencies, while in Jhang the party failed to field candidates in 3 out of 6 constituencies and got more than 5% vote in only one constituency, NA-86. Hafizabad, Bhakkar and Gujranwala were other weak showings of PTI in Central Punjab. Apart from Karachi, Sindh was mainly neglected by PTI during much of its election campaign and it shows in the results. The party failed to field its candidates in 19 out of Interior Sindh's 40 constituencies. Where it did field its candidates, it failed to clear the 5% vote benchmark in 18 constituencies. In most such constituencies, the order of the votes was in the hundreds. PTI's only strong showing in interior Sindh was in the constituencies of NA-228 Umerkot and, NA-230 Tharparkar where, the party's vice president, Shah Mehmood Qureshi's spiritual Ghousia Jamaat has a considerable following. In Karachi, PTI bagged an average of 20.37% across 18 of 20 constituencies it participated in. The constituency NA-250 of Karachi recorded the highest percentage of votes polled in the favor of PTI at 61.38%. In Balochistan, the situation was similar to that of interior Sindh. PTI failed to field its candidates in 4 out of the province's 13 constituencies. Further on, it didn't receive more than 5% of the vote in 7 of the remaining 9. Votes in most of these cases were mere hundreds. It performed relatively well in NA-259 of Quetta proper and NA-265 Sibi where the party got 14.83% and 6.99% of the vote respectively. Pakistan's 2018 elections were held on 25 July 2018 throughout the country. The elections resulted in a clear majority of the Pakistan Tehreek-e-Insaf in National assembly with 116 won seats. After 28 women and 5 Minority seats the total number of seats reached 149. Pakistan Tehreek-e-Insaf obtained 0.16 million votes with 31.82% of total cast votes, hence forming a government in the center with the alliance of MQM-P, PML (Q), BAP, BNP-M, GDA, AML and JWP. PTI also formed government in Khyber Pakhtunkhwa by having 78 seats, Punjab by having 175 seats and a government of alliance in Balochistan. Following Elections Imran Khan was elected as Prime minister obtaining 176 against Mian M. Shehbaz Sharif who obtained 96 votes. PTI was also successful in electing its Speaker and deputy speaker national assembly, Asad Qaiser and Qasim Suri respectively. On 4 September 2018, Arif Alvi got elected as 13th President of Pakistan. PTI nominated Usman Ahmad Khan Buzdar as C.M. Punjab, Mahmood Khan as C.M. KPK and Jam Kamal Khan as C.M. Balochistan. The party also appointed its governors ; Muhammad Sarwar as Governor of Punjab, Pakistan , Imran Ismail as Governor of Sindh and Shah Farman as Governor of Khyber Pakhtunkhwa. Prime Minister of Pakistan, Imran Khan appointed his cabinet with key appointments of Minister of Finance given to Asad Umar and Minister of Foreign Affairs to Shah Mehmood Qureshi. PTI promises to invest more money in education, and implement a standard, high quality education system all across Pakistan for all Pakistanis. PTI promise to give health priority, and establish a high quality healthcare system. Health insurance for those in need, the same way PTI gave 70% of people living in Khyber Pakhtunkhwa health insurance cards which give coverage of Rs5 lakh per year. High quality hospitals will be established. This will allow the poor to receive quality treatment, and would allow the rich to get treated in Pakistan rather than overseas. Tax reforms will be implemented to ensure a high rate of tax collection, and to ensure a stream of funds for the government. FBR and institutions of Pakistan to be strengthened. Tax rate to be lowered, and more people to be brought into the tax net. Rs 8000 billion in taxes to be collected per year. Corruption will be controlled by strengthening of FBR and judiciary. Economy will be strengthened through investment and tourism. Tax on exports to be lowered in order to compete with India. Overseas Pakistanis will be assisted in investing in Pakistan. Textile industry will be strengthened. People will be encouraged to start businesses, and the government will facilitate and help good business ideas. Hotels and amenities will be built all over Pakistan. Four new tourist destinations will be revealed every year. PTI promises to help people into employment by building cheap houses. This will give cheap houses for the poor, as well as create many jobs. PTI also plan to build technical universities around Pakistan, such as one they built in Haripur. This will create a skilled workforce. PTI also plan to create jobs in tourism as well as industries, such as the textiles industry. PTI will also facilitate business. Cheap houses will be built, helping create jobs and affordable houses. Technical universities to be opened all over Pakistan. Farmers will be given their rights, and the sugarcane mafia will be brought to justice. The federation of Pakistan will be strengthened through giving provinces their rights, as well as implementing a local government system and creating a new province in South Punjab. FATA will also be merged with KPK. Local government system, with directly elected mayors in all cities. New province in South Punjab. FATA to be merged with KPK. In the northwestern province Khyber Pakhtunkhwa the PTI formed a governing coalition with the Jamaat-e-Islami and Qaumi Watan parties. On 13 May 2013, Parvez Khattak was appointed Chief Minister of Khyber Pakhtunkhwa. The Khyber Pakhtunkhwa Development Advisory Committee includes Asad Umar, Jehangir Khan Tareen, Ali Asghar Khan, Khalid Mehsud and Rustam Shah Mohmand. There are 15 ministers selected from the coalition govt to form the cabinet for Chief Minister Parvez Khattak. On 17 June, the PTI-led Khyber Pakhtunkhwa government presented their budget for the fiscal year 2013–14. No new tax was imposed. The budget included increases to the salaries and pension of government employees and a higher minimum wage. Imran Khan giving autographs during a membership drive in Lahore. Vice-president Ejaz Chaudhary is on the right. A membership drive in November and December 2008 resulted in 150,000 people joining the party. Leader and Chairman of PTI Imran Khan on stage at a public gathering at Abbottabad. The National Council elects central office bearers. In March 2012, PTI announced to hold US-style intra-party election, according to a press briefing the US-style candidate nomination and ticket-awarding process, PTI would aim to introduce local caucuses on district levels throughout the country. Aspiring candidates would undertake debates and undergo primaries to win a party ticket for contesting on Provincial Assembly or National Assembly seats. The elections were held from October 2012 and ended on 23 March 2013 where the party finally elected the National Council after a long drawn electoral process with over four million registered members for their electoral college. With these elections PTI has become Pakistan's first political party to hold the largest intra party election from the general electoral base. Most of PTI's central leadership was elected, Imran Khan and Shah Mehmood Qureshi were elected on 20 March 2013. The Secretary information, Secretary Finance, Secretary Social Media, Secretary Political Training, and Secretary Policy Planning are appointed by the chairman and confirmed by the CEC. The Executive Committee consists of the Central Office bearers (above) and thirty-members to be nominated by the chairman from amongst the members of the National Council. The elected Provincial Council was finalised on 18 March 2013 for a 4-year term by the various districts of each province it is as follows Punjab, Sindh, Baluchistan & Khyber Pakhtunkhwa. In June 2014 a Central Tarbiyati Council was created whose convener is Firdous Shamim Naqvi, Incharge for Curriculum Development Abdul Quayyum Khan Kundi, Incharge Material Production Khawar Shamsul Hasan, Incharge Implementation and Monitoring Col Ejaz Minhas. The Tarbiyati Council will be responsible to train party activists on ideology, election campaign and other organizational matters. The Insaf Student Federation is the official student wing of Pakistan Tehreek-e-Insaf. ISF is present in all provinces of Pakistan. ISF has been celebrated as the best student organisation of any political party in Pakistan. Glorified for its activism and political prowess, ISF has held many protests and rallies in all parts of Pakistan to create awareness about different issues. Pakistan Tehreek-e-Insaf has a dedicated wing for women, led by Munaza Hassan as its elected President and Nafessa Khattak as its elected general secretary. PTI strongly declares its recognition of the rights of women, and undertakes to promote and implement policies that protect women from all strata of society, especially the middle and working classes, recognising urban and rural as equal citizens and encouraging the participation of women in national and political life. Pakistan Tehreek-e-Insaf strongly believes in representation of women at all decision-making levels. Pakistan Tehreek-e-Insaf has a youth wing for people under the age of 40 to help bring attention to their issues and problems. PTI Youth Wing is led by Ali Abbas Bukhari as the elected President. On 18 March 2013 Pakistan Tehreek-e-Insaf became the first political party in Pakistan to announce a comprehensive policy for persons with disabilities (PWD). In its vision PTI would like to ensure the rights of disabled people and they be provided with enough opportunities to play their vital role in society. The party strongly believes in the implementation the 1991 ordinance which ensured a special quota for persons with disabilities. PTI will acknowledge, facilitate and empower all PWDs enabling them to lead independent and self-fulfilling lives. PTI will also raise awareness about integration of persons with disabilities into society would work towards the prevention of certain avoidable disabilities through early diagnosis and medical treatment. Fulfilling its commitment to persons with disabilities, the KPK government led by the PTI has approved a budget of over Rs 59 Million initially to help provide rehabilitation services to handicapped people at the local hospital near to their area, it is initially slated to be launched in all 25 districts of the province but will expand further with additional budgetary provisions. Insaf Research Wing (IRW) was a part of Pakistan Tehreek-e-Insaf (PTI) created to carry out research to find solutions for problems in Pakistan. IRW was created in 2009 to carry out research to find solutions for problems in Pakistan. The foremost goal of IRW was to keep people of Pakistan and PTI informed and prepared. The wing was composed of 9 committees. Each committee addressed issues related to its field of expertise, which included socio-political, information & technology, economics, energy, healthcare, corruption, foreign affairs, education & environment. The research reports/papers were either commissioned by the central executive committee of PTI or committee members of IRW. The IRW did not follow a preset ideology while carrying out research, nor did it endorse any opinion presented in a published report/paper as an official position. Any published document by the wing did not constitute it as an official position of PTI unless otherwise stated. IRW operated at a national level but its members were located throughout the world bringing in the much needed international experience. IRW practiced an open membership policy valid for all Pakistanis regardless of religion or race. The IRW has since been replaced by the Insaf Research Team. PTI launched its first dharna on 14 August 2014. The party was involved in laying siege and paralyzing capital of Pakistan, Islamabad in an effort to stop the Government from functioning. PTi has been charged in attacking Pakistan television and parliament and also attacking law enforcement. The city was kept paralyzed for three months before the party decided to call off the protest. The party founder Imran Khan burned his utility bills in order to incite the participants into civil disobedience. PTi former leader and in charge for party election tribunal to investigate the corruption and fraud and PTI's internal election rigging. His tribunal expelled Secretary general Jahangir Tareen, PTI's KPK Chief Minister Pervez Khattak and senior leader Nadir Laghari after for manipulating intro-party polls and also reported frauds in party funds. Wajihuddin was later expelled from the party by Imran Khan. PTI has been reported to have attacked media persons during their protest demos. Several female journalists have reported harassment by the party workers. The harassment of women has also been frequently reported in PTI's gatherings. During PTI's public protests, Geo News DSNG's had to remove their stickers in order to escape party workers' vandalism. PTI workers also attacked Geo News Islamabad office. PTI's ex president Makhdoom Javed Hashmi has alleged that Imran Khan was conspiring to dissolve the government with the Supreme court's chief justice Nasir ul Mulk. This list is subject to the Biographies of living persons (lists) policy and the lists of people guideline. Please familiarize yourself with both before editing this list. In addition, note that a reliable source that justifies inclusion in this list must be provided for any new entry. ^ a b c Khan, Sidrah Moiz (27 June 2012). "'Pakistan's creation pointless if it fails to become Islamic welfare state'". The Express Tribune. ^ a b c d Michaelsen, Marcus (27 March 2012). "Pakistan's dream catcher". Qantara.de. ^ a b c d e f g "Constitution of Pakistan Tahreek-e-Insaaf". PTI official. ^ "Pakistan: Populist Imran Khan set to become new premier". Anadolu Agency. 26 July 2018. ^ a b c d e f g h "Imran floats agenda for 'new Pakistan'". Dawn. ^ a b "PTI: Brand and ideology". The Nation. 28 July 2014. ^ Yusuf, Moeed (23 January 2012). "PTI impact on politics". Dawn. Retrieved 20 March 2019. ^ "The U.S.-Style Liberal–Conservative Divide Doesn't Translate to Pakistan". National Review. 18 September 2017. Retrieved 20 March 2019. ^ "PTI to edge ahead of PML-N: Credit Suisse reports on its research". Pakistan Today. Retrieved 20 March 2019. ^ a b "PTI Ideology". PTI official. ^ "Everyone is equal, state has no religion: Imran Khan". Dunya News. 16 April 2015. ^ "The End of Ideology". Newsweek Pakistan. 17 August 2015. ^ "Voting positions: PTI won more popular votes than PPP". The Express Tribune. 22 May 2013. ^ "PTI — the new Left? - The Express Tribune". The Express Tribune. 28 May 2013. ^ Malik, Samia (13 August 2012). "Behind closed door, PTI facing intra-party woes". The Express Tribune. ^ Malik, Mansoor (31 October 2012). "PTI marks 'Revolution Day'". Dawn. ^ Hassan, Mirza (8 November 2011). "'PTI to field 1000 candidates in next election'". The News Tribe. ^ "PTI chief will have a two-term limit, says Imran Khan". The Express Tribune. 20 March 2013. ^ "Fauzia Kasuri was never a founding member: Imran Khan". The Express Tribune. 6 June 2013. ^ "Foreign Aid to Pakistan is 'Curse': Imran Khan". International Business Times. 26 September 2011. ^ "Days of 'most corrupt rulers' are numbered now: Imran". The News International. 25 November 2011. Archived from the original on 21 October 2013. ^ "PTI will protect rights of minorities, says Imran". Daily Times. 15 December 2011. Archived from the original on 21 October 2013. ^ "PTI to protect rights of minorities: Imran". The News International. Archived from the original on 26 December 2011. ^ "Imran vows to turn Pakistan into Islamic welfare state". Khaleej Times. 27 December 2011. ^ Basil Nabi Malik (24 December 2011). "The PTI's promises". The News International. Archived from the original on 21 October 2013. ^ "Education Policy". PTI official. ^ "PTI Education Policy". Scribd. ^ "PTI unveils its much awaited "Education Policy Vision"". PTI official. 20 February 2013. ^ "PTI assures women of end to discrimination". Daily Times. 12 December 2011. Archived from the original on 21 October 2013. ^ "Second coming". The Economist. 12 November 2011. ^ "PTI to change Thana, Patwari cultures: Imran". The Nation. 16 December 2011. ^ "PTI Chief Imran Khan declares assets". Dawn. 4 December 2011. ^ "Mass civil disobedience call issued by Imran Khan's party to unseat government". Pakistan Telegraph. 19 August 2014. ^ "Imran Khan resigns from National Assembly with party members to intensify pressure on Sharif government". Pakistannews.net. 23 August 2014. ^ "Imran vows to bring army, ISI under civilian control". Daily Times. 12 November 2011. Archived from the original on 13 November 2011. ^ a b "Imran Khan says army, ISI will be kept under check". Firstpost. ^ "Imran Khan vows to bring army, ISI under civilian control if in power". OnePakistan.com. 12 November 2011. ^ "Protesting Pakistanis block NATO supply route". Al Jazeera English. 23 November 2013. ^ "US should stop violating Pakistan's sovereignty; Chairman Imran Khan told Ambassador Munter in a meeting at PTI Secretariat". defence.pk. 17 December 2011. ^ "Nawaz, Imran Khan assured me of a pro-US government: Munter". The Express Tribune. 10 July 2012. ^ Fawad Khan (15 November 2012). ""I will make Kashmir issue my top priority": Imran Khan". AAJ.tv. ^ "Imran Khan kicks off poll campaign in Pakistan". India Today. 21 April 2013. ^ "Imran opens Lahore poll war front". The Nation. 21 April 2013. Archived from the original on 21 April 2013. ^ "Covering new ground: Imran Khan to address Karak, DI Khan". The Express Tribune. 21 April 2013. ^ "Will begin new Pakistan after three weeks: Imran". Geo.tv. 21 April 2013. ^ "Imran Khan vows to release Pakistan from US slavery". The Nation. 22 April 2013. Archived from the original on 23 April 2013. ^ "Imran kicks off Rawalpindi campaign". The Nation. 23 April 2013. Archived from the original on 23 April 2013. ^ "Imran throws down gauntlet to Nawaz, invites him to debate". Geo.tv. 23 April 2013. ^ "PML-N used govt funds for political gains: Imran Khan". Geo.tv. 24 April 2013. ^ "Funds should have been used on energy not metro bus: Imran". The News International. 25 April 2013. Archived from the original on 19 October 2015. ^ Kashif Zafar (26 April 2013). "Lodhran rally: May 11 would prove a day to celebrate, says Imran Khan". The Express Tribune. ^ "PTI to end system of tyranny: Imran Khan". Pakistan Today. 26 April 2013. ^ "Imran terms 'system of oppression' major problem". Geo.tv. 26 April 2013. ^ "Election trail: Imran Khan wraps up campaign in Seraiki belt". The Express Tribune. 27 April 2013. ^ "Continuing Campaign: PTI to fix Pakistan's ruined system, says Khan". SAMAA TV. 28 April 2013. ^ "PTI's 'passion' to overwhelm PML-N's 'profusion': Imran Khan". GEO TV. 29 April 2013. ^ "You can't lead revolution from behind bullet-proof glass: Imran". Dunya News. 30 April 2013. Archived from the original on 3 May 2013. ^ "PTI to stop operations in Balochistan: Imran". Pakistan Today. 1 May 2013. ^ "Imran Khan brazen in Pakistan campaign". News24. 30 April 2013. ^ "Imran says the change has already come to Pakistan". The News International. 3 May 2013. Archived from the original on 19 October 2015. ^ Jason Burke (3 May 2013). "Imran Khan reaches out to young voters with 'third-way' in Pakistan's general election". The Guardian. ^ "PTI to abandon war on terror, if voted to power: Imran". Dawn. 4 May 2013. ^ "PTI Lahore rally: Imran Khan says change has arrived". The Express Tribune. 23 March 2013. ^ "Imran vows to be truthful, loyal with masses after assuming powers". The Nation. 23 March 2013. ^ "Weather interrupts 'Tsunami rally'; Imran makes six promises". Dawn. 23 March 2013. ^ Mackey, Robert (7 May 2013). "Video of Imran Khan's Fall at Election Rally in Pakistan". The New York Times. ^ "Imran falls off stage at Lahore rally; sustains serious injuries". Dawn. 8 May 2013. ^ "Imran Khan injured in Pakistan campaign rally fall". BBC. 7 May 2013. ^ "Imran out of danger at SKMH". Dunya News. 7 May 2013. ^ "Pakistan's Imran Khan in hospital after rally fall". Bangkok Post. 7 May 2013. ^ "Imran Khan falls off rally stage, suffers head injuries". Zee News. 8 May 2013. ^ "Shahbaz Sharif visits injured Imran Khan in hospital". The News International. 8 May 2013. Archived from the original on 21 October 2013. ^ "Imran Khan badly injured: Nawaz Sharif cancels election campaign for Wednesday to show solidarity". Dainik Bhaskar. 8 May 2013. ^ "Nawaz prays for Imran's health, says wont campaign Wednesday". The News International. 7 May 2013. Archived from the original on 21 October 2013. ^ "Tehrik-i-Insaf sweeps Khyber Pakhtunkhwa". The Nation. 12 May 2013. ^ "Imran's tsunami: Khyber-Pakhtunkhwa lives up to tradition". The Express Tribune. 13 May 2013. ^ "ECP results show PTI second largest in Karachi". The Express Tribune. 14 May 2013. ^ "Imran Khan wins from NA-71 Mianwali, NA-1 Peshawar, loses NA-122 Lahore". Pak Watan. 12 May 2013. ^ "PTI concedes defeat in Pakistan elections". The Express Tribune. 12 May 2013. ^ "Provincial assemblies: As numbers add up PML-N shows strength in Punjab, PTI holds KP". The Express Tribune. 13 May 2013. ^ "Pakistan Elections 2013 – Detail National Assembly Results". Hamari Web. ^ Tunio, Hafeez (28 November 2011). "Qureshi's religious awakening: Sajjada Nashin orders his followers to reorganise themselves". The Express Tribune. ^ a b c d e f g "11 Points Agenda Towards The Dream Of Naya Pakistan'". Pakistan Tehreek-e-Insaf. ^ "Sehat Insaf Card launched'". Dawn. ^ a b "Central Secretary Information PTI Fawad Chaudhry Media Talk Lahore (30.04.18)". Facebook. ^ "Imran Khan Speech Digital Youth Summit 2018 Peshawar | 27th April 2018 | Pak News". Youtube. ^ "Imran Khan's party set to form govt in Khyber-Pakhtunkhwa". Business Standard. 14 May 2013. ^ "PTI, JI reach deal on forming KP govt". Pakistan Today. 14 May 2013. Archived from the original on 29 January 2015. ^ "Imran Khan finalises Pervaiz Khattak as next K-P chief minister". The Express Tribune. 15 May 2013. ^ "PTI grabs 10 women special seats in KPK". Business Recorder. 29 May 2013. Archived from the original on 21 October 2013. ^ "Khyber PakhtunKhwa Ministers". Khyber Pakhtunkwa Govt Portal. ^ "Khyber Pakhtunkhwa makes it tax-free". The Nation. 18 June 2013. ^ "Analysis: In Khyber-Pakhtunkhwa budget, PTI lays out a strong start". The Express Tribune. 18 June 2013. ^ "PTI leaders addressing the workers convention at Nasir Bagh" (in Urdu). PTI official. 30 November 2008. Archived from the original on 15 March 2012. ^ "1 lac members officially achieved and 500 lawyers join PTI in Lahore" (in Urdu). PTI official. 30 November 2008. Archived from the original on 15 March 2012. ^ "Peshawarites throng PTI membership camps" (in Urdu). PTI official. 21 December 2008. Archived from the original on 31 August 2013. ^ "People positively respond to PTI membership campaign". PTI official. 22 December 2008. Archived from the original on 15 March 2012. ^ "Peshawar Gives Imran Khan Historic Reception". PTI official. 23 December 2008. Archived from the original on 31 August 2013. ^ "PTI enrols 57,625 members in 8 days in N.W.F.P". PTI official. 31 December 2008. Archived from the original on 31 August 2013. ^ "Imran Khan concludes membership campaign in Faisalabad". PTI official. 3 February 2009. Archived from the original on 17 March 2012. ^ "Official results of KP local government elections announced". Retrieved 16 August 2018. ^ "Intra-party Elections 2012". PTI official. Archived from the original on 19 October 2013. ^ "Code of Conduct for the Intra-Party Election of Pakistan Tehreek-e-Insaf, 2012". PTI official. Archived from the original on 19 October 2013. ^ a b c "Elected Office-Bearers of the National Council". PTI official. 24 March 2013. ^ "Imran Khan elected PTI chairperson unopposed". The Express Tribune. 20 March 2013. ^ "Intra-party elections: Imran elected PTI chief unopposed". The Express Tribune. 21 March 2013. ^ "Punjab: Provincial Organisation Election Result". PTI official. 17 March 2013. ^ "Sindh: Intra-Party Election Results". PTI official. 16 March 2013. ^ "Balochistan: Provincial Election Results". PTI official. 18 March 2013. ^ "KPK – Regional Results". PTI official. 26 February 2013. ^ "Ejaz Chaudhry elected as PTI Punjab president". Dunya News. 18 March 2013. ^ "PTI becomes the First Pakistan Party to announce Policy Vision for Disabled Persons" (in Urdu and English). PTI official. 18 March 2013. Archived from the original on 21 October 2013. ^ "PTI unveils policy for disabled persons". The Nation. 19 March 2013. ^ "Disabled people to get free therapy at DHQ hospitals". Dawn. 2 April 2014. ^ "Getting Involved in Insaf Research Wing". Support Imran Khan. ^ "Insaf Research Wing (IRW)". Pakistan Tehreek-e-Insaf. 6 January 2009. Archived from the original on 29 October 2013. ^ "Insaf Research Team". PTI official. ^ "PTI worker involved in attacks on PTV and Parliament House gets bail". The Nation. 13 November 2014. ^ "ATC directs police to arrest Imran, Qadri in PTV attack case". The Express Tribune. 21 October 2016. ^ "PTV attack case: Pakistan court directs police to arrest Imran Khan, others". The Times of India. 21 October 2016. ^ "Imran Khan joins civil disobedience movement, burns power bill". Dawn. 20 September 2014. ^ "PTI tribunal 'punishes' party stalwarts". Dawn. 16 June 2015. ^ "PTI election tribunal orders to expel Jahangir Tareen, Nadir Leghari". Dunya News. 16 June 2015. ^ "Wajih-led tribunal reports misuse of funds, divisions within PTI". Dawn. 15 July 2015. ^ "Imran Khan suspends Justice (r) Wajihuddin's PTI membership". Dawn. 5 August 2015. ^ "Media teams attacked while covering protest demonstrations in Pakistan". IFEX. Pakistan Press Foundation. 17 December 2014. ^ "5 awful responses to Sana Mirza's harassment at the PTI rally". Dawn. 16 December 2014. ^ "PTI attacks on journalists a result of what Imran says on stage". The News International. 16 December 2014. ^ "Curbing harrassment: [sic] For women's safety, PTI goes the extra mile". The Express Tribune. 30 September 2016. ^ "Women harassment at PTI rally caught on camera". 24 News HD. 3 May 2016. ^ "PTI workers attack Geo News' DSNG van in Swabi". Geo.tv. 1 November 2016. ^ "PTI workers attack Geo TV DSNG near Burhan". The News International. 2 November 2016. ^ "Media teams attacked while covering protest demonstrations in Pakistan". CPU Media Trust. 18 December 2014. ^ "PTI workers attack Geo News Islamabad office". Geo.tv. 14 September 2014. ^ "Hashmi says Imran conspired with 'disgruntled elements in the army' during 2014 sit-in". Dawn. 2 January 2017.